As a fisheries and biodiversity officer, I have the opportunity to get involved in a number of exciting projects, helping to ensure fish populations are doing well and habitats are improving. One of my latest projects involved putting ‘hedgehogs’ in the water to protect fish – more about this later! Based around the Cambridgeshire and Bedfordshire area, I am often out and about providing important fisheries management advice and ensuring that sites have the right permissions to do things like bringing new fish into their river, lake or pond. Working over a wide area leads to a varied and challenging, but really enjoyable, working day. I am busy at the moment issuing a lot of newly introduced permits that allow fisheries to bring new fish into their water. It’s important that this is regulated to ensure that new fish don’t bring disease with them, and that they will thrive in their new environment. But the old system involved a lot of paperwork and often fisheries owners had to apply every time they wanted to stock new fish. The new permits help to simplify the process and can be done over the phone. They are permanent and where there is no additional risk to the wider environment, they remove the need to apply for an individual consent every time, cutting the paperwork for everyone. It’s extremely important that the current and future management of any fishery is checked before stocking to ensure the fish survive and do well. Often the best way to do this is by developing a fishery management plan that looks at stocking as well as everything else that’s going on at the fishery. We provide advice and guidance to our customers to help them complete the fishery management plans. Good habitat will ensure that the fish do well and may enable less stocking and future costs, especially on still water coarse fish fisheries. If the habitat is improved and the management plan deals with the other pressures, the fish may breed and look after themselves. Some fisheries that provide a good habitat and a healthy environment end up taking fish out instead of needing to stock. For some fisheries this could generate money to cover other costs involved with managing the fishery. 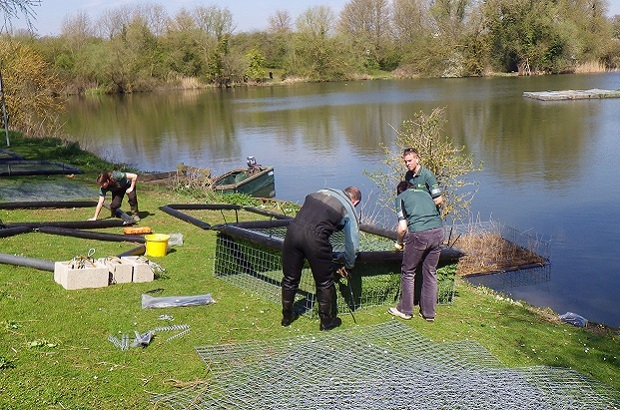 Using artificial habitat is a great way to improve fisheries as it can provide important cover and the right conditions for fish to spawn and lots of other wildlife benefit too. Plastic ‘Hedgehog’ reefs are one example of an artificial reef. Hedgehogs have recently been installed at Mepal Pit, Cambridgeshire. 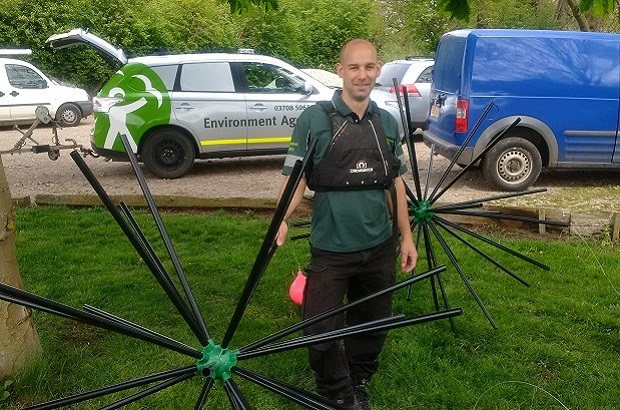 We had been involved in helping the club for a number of years and as part of an Environment Agency funded trail, we provided and installed these hedgehogs to try and help fish get away from cormorant predation, especially in the winter when the aquatic vegetation dies back. The Hedgehogs are named so because they are spiky, plastic balls, about one metre in diameter. When fastened on the river bed, they create a complex matrix of space that any size of fish can hide in, but the cormorants can’t swim through. These hedgehogs are widely used in lakes in the USA, where they were invented. Floating Reed Rafts are another great example of artificial reef that have been used at Roswell Pits near Ely, these have the same benefits as the hedgehogs, creating space for fish to hide away from predators. These artificial reefs are much needed refuges and will help to protect and restore fish populations and enhance habitat. What do schoolchildren think about looking after water?